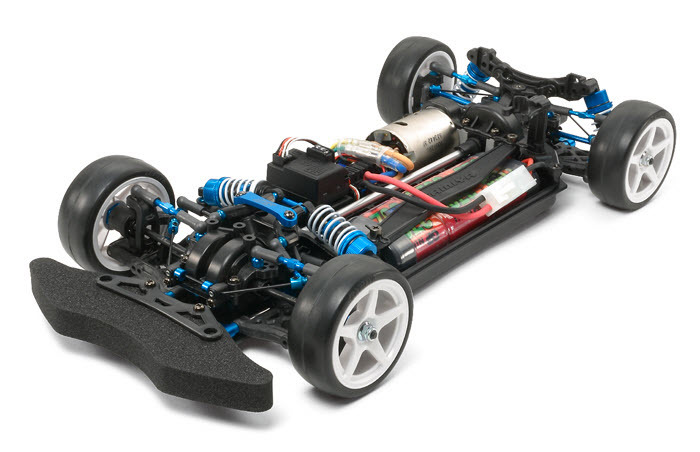 TB-03R Chassis Kit features many race-spec parts to enable a wider suspension setting possibilities. In addition to traditional upgrade parts such as TRF special dampers, F/R stabilizers, and aluminum suspension mounts, it is also equipped with a new aluminum rocker bridge which further enhances front suspension rigidity. Also comes with a front damper stay to provide you with the choice of an Inboard Front Suspension set up or the standard outboard suspension set up. Furthermore, to efficiently transmit the motor power, assembly universal shafts and precision bearing holders are also included. These high-performance parts will help further tune your machine and ready you to win!